Abacus math is an instrument made up of sticks and beads.The sticks represent the place of number and beads are used for the numbers. 1st stick from the right is ones place or unit place and 2nd stick is for ten’s place. For 1st grade of Math we will discuss only two digit number. In the above picture, there are two sticks. 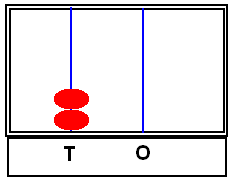 One from the right side is one place or unit place stick and the next is tens place stick. So the number formed is 20. So the number is 13. 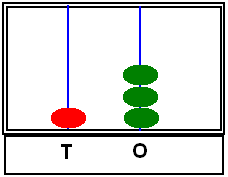 In this way we can write the numbers using abacus. The child has to lean the spellings of these number names only and rest of the number names he/she can be write using the above number names. © and ™ ask-math.com. All Rights Reserved. 2010 - 2012.